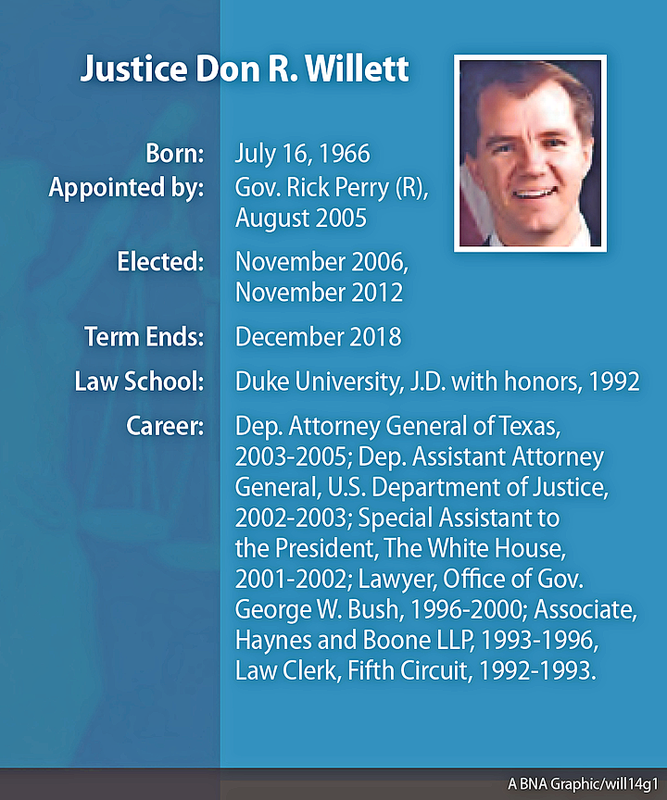 Nov. 16 — President-elect Donald Trump’s first nominee for the U.S. Supreme Court could be a champion of “economic liberty”—Texas Supreme Court Justice Don R. Willett. Willett, a “Tweeter Laureate” praised by conservatives and libertarians, is on Trump’s list of potential nominees. Trump has said he will choose someone from that list to replace Justice Antonin Scalia, who died unexpectedly Feb. 13. The U.S. Senate has refused to take action on President Barack Obama’s nominee, D.C. Circuit Chief Judge Merrick B. Garland. Conservatives and libertarians have praised Willett as a defender of economic liberty. Willett said such liberty is “‘deeply rooted’” in the U.S.'s history, concurring in Patel v. Tex. Dep’t of Licensing & Regulation, 469 S.W.3d 69 (Tex. 2015). Patel invalidated a state requirement that eyebrow threaders finish 750 hours of training to receive a license to practice their trade. The “right to engage in productive enterprise is as central to individual freedom as the right to worship as one chooses,” Willett said. Willett cited abolitionist and former slave Frederick Douglass’s happiness at being able to earn money after being freed. Douglass’s “irrepressible joy at exercising his hard-won freedom captures just how fundamental—and transformative—economic liberty is,” Willett said. Regulations that restrict economic liberty should be examined under a “rational basis with bite” test that demands “actual rationality, scrutinizing the law’s actual basis, and applying an actual test,” Willett said. Willett is known for his social media prowess, and was named “ Tweeter Laureate of the 84th Texas Legislature” by the Texas House of Representatives. His tweets are often humorous. But they also have a practical end—staying in touch with voters. He won elections to serve on Texas’s high court in 2006 and 2012, after he was appointed to fill a vacancy on that court in 2005. In “a state of 26 million people, 254 counties” and “a couple of timezones,” it’s “really political malpractice not to connect and engage voters smartly through social media,” Willett told Fox News in an interview posted on his campaign website. Willett’s love of Twitter is a point of commonality with Trump, who also used it as a campaign tool. But Willett hasn’t been afraid to poke fun at the president-elect. One tweet, written as a haiku before Willett was named on Trump’s list, asked who “the Donald” would name to the high court. “The mind reels. *weeps—can’t finish tweet*” Willett said. Willett agrees with the organization that the judiciary shouldn’t legislate from the bench. Willett had deep ties to President George W. Bush before joining Texas’s high court. The Texas native served as an attorney for then-Governor Bush from 1996 to 2000. He also advised Bush’s 2000 presidential campaign and transition team. Willett then followed Bush to the White House, serving as his special assistant before becoming a deputy assistant attorney general at the Department of Justice.